Watch the University of Dubuque campus transform with the addition of the Heritage Center. The University of Dubuque's principal performance venue, John and Alice Butler Hall, is an intimate, breathtaking space that can comfortably accommodate close to 1,000 patrons in performances by University performing arts groups as well as local, regional, and national touring troupes in music, dance, and drama. The warm, earth-tone color palette that is continued in the hall underscores the warm, friendly welcome one receives from design elements upon entering the Heritage Center through the A.Y. McDonald Lobby. Audiences, performers, and speakers can interact with one another since the distance from the lip of the stage to the top row of the balcony is less than 90 feet. View the seating chart here. Butler Hall comes with all the archetypal accoutrements, from a large stage to accommodate a 100-piece orchestra to the orchestra pit, fly loft, scene shop, costume shop, dressing rooms, green lounge, performance equipment, and prop storage. 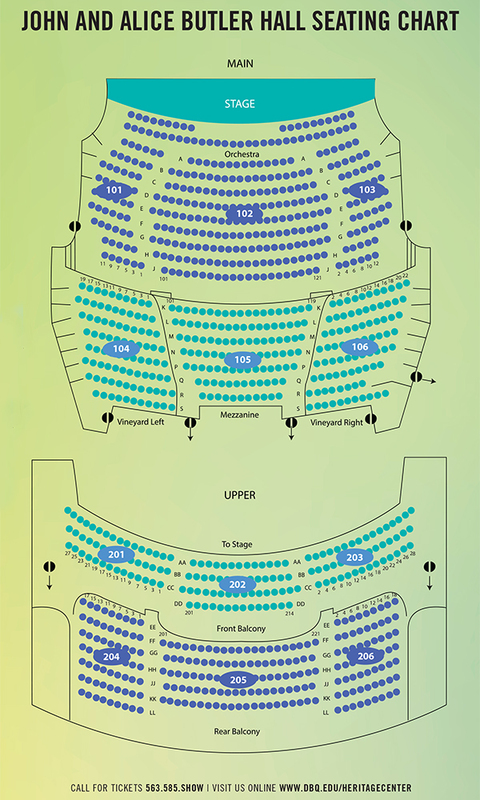 The audience seating is comprised of numerous vineyard seating platforms, balcony tiers, and boxes designed to afford uncompromised views and acoustics for every seat in the house. Butler Hall can be scaled from the smallest performance to the largest performance. Every consideration has been given to ensure any level or nature of performance is accommodated, with particular attention to acoustics, lighting, rigging, and - importantly - patron comfort. The Babka Theatre is a 200 seat black box theatre that provides exceptional space for drama and dance that can also function as a classroom and lecture hall. The only part of Heritage Center that departs from its earth-toned color palette, the space's walls, floors, ceiling, exposed catwalks, and velour curtaining are black. The theater provides versatile, first-class instructional space for a nascent drama program. A set/scene shop, costume shop, and dressing rooms provide backstage support that will create the opportunity to accelerate the drama program's growth. Babka Theatre also provides instructional and rehearsal space for an evolving dance program. There is a mirror, balance bars, and, perhaps most importantly, a sprung floor that reduces the possibility of injury to dancers upon which a Marley dance floor can be rolled out for rehearsal and performances. Black box theatres generally do not have windows; however, Babka Theatre has five windows that can be left exposed for classes and guest lectures. A ring gallery offers expanded seating space and back-of-house support for sound and lighting. The CyberCafé’s Knapp Stage is a popular place for guest artists, student open mic performances, guest speakers, and concerts during lunch, dinner, and evening hours. It is often used for pre-show functions prior to mainstage events in Butler Hall. Straatmeyer Rehearsal Room functions as a venue for rehearsals, classrooms, small guest lectures, and more. ‌The Aitchison-Welch Choral Rehearsal Room is named to honor iconic English faculty member Anna Aitchion and former UD President Dale Welch and his spouse, Lucille Aitchison Welch (C’23). This room, with a tiered flood, can accommodate 60 students. It can be used as a classroom in addition to a choral rehearsal space. From the moment one approaches the entrance to the A.Y. McDonald Lobby, Heritage Center "tips its hat" in welcome as the glass curtain wall facing south and west pitches out at 10 degrees. Upon entering, one's eye is drawn both skyward by the 33 foot height and forward by the warm, inviting color of the walls that seem to "open their arms" in welcome. Entrances to Butler Hall are marked with doors that introduce a stylized treble clef theme that is carried through Heritage Center in a number of forms. The lobby has ample space to comfortably accommodate patrons gathering before and after performances. It also serves as the location for special UD celebrations and dinners. The glass-walled Charles and Elizabeth Bisignano Gallery is at one of the busiest crossroads of Heritage Center. The gallery, one of the many opportunities for Art and Worship by Osmosis in Heritage Center, is situated along the major student traffic pattern from the South Campus to North Campus. The spacious Linda Chlapaty Music Education Suite honors Linda Chlapaty who, together with her husband, Joseph (C'68), provided much of the financial support that launched UD into a future bright with possibility and potential. She is an educator and a former teacher. The suite holds 10 individual, sound-isolating practice rooms with pianos, keyboards, guitar amps, and percussion equipment. 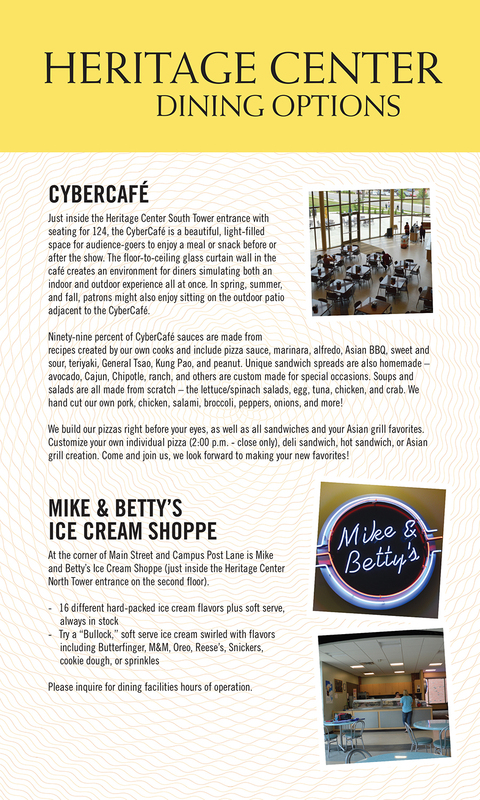 The CyberCafé, with seating for 124, is a beautiful, light-filled space to enjoy a meal or snack. The University's traditional dining hall in Peters Commons has, over the last decade, reached its capacity in its ability to serve students. CyberCafé provides a second space for students to dine. The floor-to-ceiling glass curtain wall in the café makes one feel as though one is both inside and outside the building all at once. In spring, summer, and fall, a door in the curtain wall provides the means to use a patio with tables and umbrellas. Cantilevered over the lower level of the Cybercafé, the American Trust Lounge has a tree house effect. It's a perch from which to view activity on the first floor of the café and a fresh perspective on the South Quad. For hours and more information, click here. Adjacent to Babka Theatre is the Palmer-Noone Lounge, which functions as a green room for University and guest performances in Babka Theatre and Butler Hall. In everyday use, it functions as one of the many quiet places throughout the building for students to meet and study. ‌The Mark and Cheryl Falb Balcony offers patrons and guests one of the most dramatic views on campus. From the balcony, one can observe the entire performance hall lobby as well as the Chlapaty Recreation and Wellness Center, the football stadium, South Campus, and beyond campus to the hills that surround Dubuque to the south and west. The balcony also provides easy access to the balcony area of Butler Hall. Sparty's Convenience Store was created in response to student requests for a campus store that would carry sundry, personal, and convenience items. The name, of course, refers to Spartan Nation's iconic, playful symbol, Sparty, which has a strong presence throughout the store. Mike and Betty's Ice Cream Shoppe has 16 different hard-packed ice cream flavors plus soft serve. Try a "Bullock" with flavors including Butterfinger, M&M, Oreo, Reeses, Snickers, cookie dough, and sprinkles. Heritage Center also includes a display venue for archival and heritage articles and artifacts from UD's history. This important heritage piece is housed in the Main Hall lobby with proximity to the art gallery and other public spaces.